On September 17, 2009 Fabian Perez was named the official artist of the 10th Annual Latin GRAMMY® Awards. 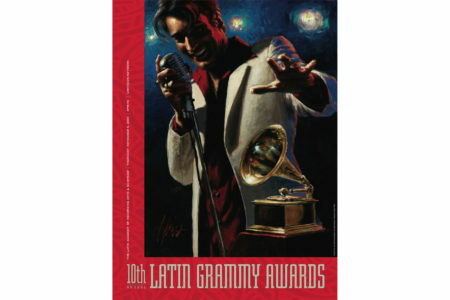 Fabian's original Latin GRAMMY® painting was used as the official image for the world's premier Latin music event. It graced the cover of the 10th Annual Latin GRAMMY® Awards invitation, show tickets, poster, program book, and other important applications. The commissioned artwork was unveiled at a press conference in Los Angeles announcing the Latin GRAMMY® nominees for 2009.